Riots erupted in Georgia as protesters gathered to demand footballer Guram Kashia be kicked off the national team for wearing an armband in support of gay rights. Right-wing group Georgian March organized a demo demanding Kashia be banned after he wore a rainbow captain’s armband while appearing for his Dutch club side Vitesse Arnhem against PSV Eindhoven on Sunday. The armband was in support of rights for the LGBT community and formed part of the country’s larger ‘Coming Out Day’ initiative. 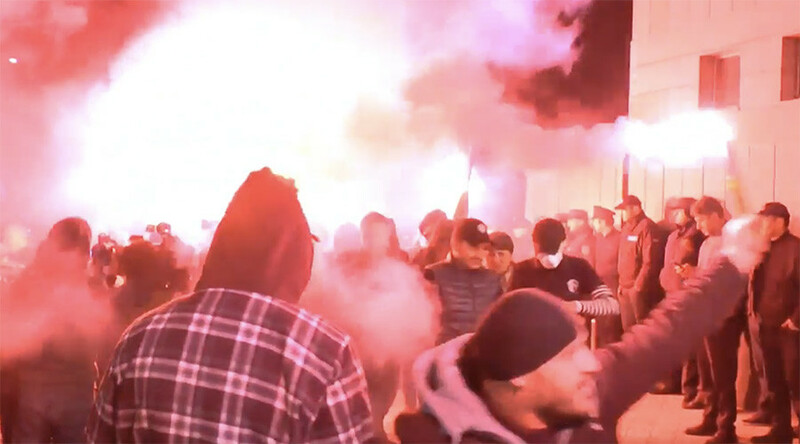 In response, dozens of protesters gathered to march outside the Georgian Football Federation in the Georgian capital, Tbilisi, shouting homophobic epithets, lighting flares and smoke bombs, and reportedly burning a rainbow flag. AP reported that eight people were detained for resisting police and minor hooliganism, and they were due to appear in court on Wednesday. “Everyone has the right for freedom of expression,” Georgian President Giorgi Margvelashvili said in a statement on Facebook on Monday. “We should respect human rights and liberties. I stand with the unanimous support that sporting society has expressed toward Guram Kashia,” he added. Meet Guram Kashia, a Georgian who made history becoming 1st Eastern European football player openly supporting struggling local LGBT community. This is what a badass equality really looks like. Kashia previously told Dutch TV channel NOS he is proud to support equal rights and he has no intention to stop playing for Georgia. Washington Post journalist Maxim Eristavi praised Kashia as “a Georgian who made history becoming 1st Eastern European football player openly supporting struggling local LGBT community” on Twitter. “This is what a badass equality really looks like,” he added.